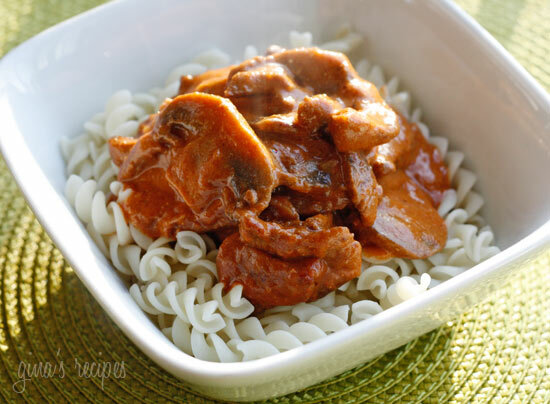 There are many variations of Beef Stroganoff recipes out there and chances are your favorite recipe is the one you grew up eating it as a child. Some like it with or without mushrooms, peas, wine, tomato sauce, etc. This is the recipe I grew up eating (lightened up a bit). Now, I don’t usually make recipes with canned soup, but I’ve always enjoyed this as a kid, so I thought I would share Mom’s recipe. It’s been years since I’ve eaten this, and this was my family’s first time tasting it, so they were the deciding factor if this would get posted or not. Two thumbs up from my picky daughter! She loved it, even ate the mushrooms to our surprise! 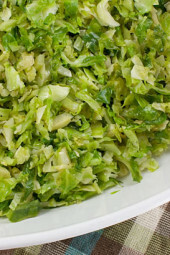 Growing up we ate this over egg noodles but to lower the points, why not serve this over spaghetti squash? In a heavy saucepan, heat pan over high heat. When pan is hot, spray with oil and add steak. Lower heat, melt butter, then add onions. Cook about 2-3 minutes until translucent, add garlic and mushrooms and sauté about 2-3 more minutes until cooked. Add a can of tomato soup, steak, water, bay leaf, and worcestershire sauce. Cover and cook on low about 40 minutes. Remove bay leaf and mix in sour cream. I used 96% ground beef, it was very good! I didn’t need to use butter to cook down the onions or mushrooms as the ground beef leaves a very tiny amount of grease. I will make this again. I cooked mine in the crockpot tonight and it was WONDERFUL! I just found your website a week ago and visit 3-4 times a day for ideas. For those who may be looking for tips on crockpot, this is what I did. I first emptied tomato soup and worcestshire into crock on Low. While that was warming, I cut my onions, mushrooms (portabello), and garlic. I then began browning my meat. While that was browning, I sauteed the mushrooms, garlic and onion together. Poured it into crock. Finished meat and poured in with the rest of base in crock. My cut of meat wasn't the best, but I was so happy that it still turned out great (Angus Stew Meat–Pork Roast). I let this all simmer together for 4 hours on Low. I did not add the sour cream until the last hour. As far as the water question—my cooking method was different but I added 1/3 can water (from soup can) and the flavor and texture/consistency was amazing. Also, I tried yellow squash and zucchini noodles for the first time tonight and Oh my heavens, I'm never going back to grain. They were so light and smooth and a wonderful compliment to this Stroganoff. Thank you Gina! Keep 'em coming! I have found my inspiration!!! Can this be done in the crockpot? I used to make a crockpot version, but don't remember how..? Hi! 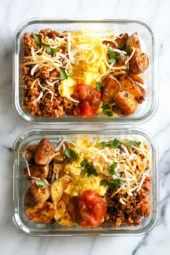 I just found your site and am excited to try your recipes! Working on a grocery list now. : ) I am a WW member and am curious, are the points listed just counting the stroganoff? I am assuming the egg noodles would be calculated separately? I wonder if anyone has had any success making this in the crockpot. I want to try it, but wanted to see if anyone had done it and what adjustments they might have made. Hi Gina! thank you for the recipe:) do you know if this freezes well? Turned out really good! Thanks for another great one Gina, it's perfect for my shoe – string in grad school budget! Mine was really watery too. I don't think you need the water at all. Then I tried to burn off some of the liquid and overcooked the meat.. eeks. I will definitely try again though. I made this tonight and it was very tasty. Mine was also very watery so I put noodles in it toward the end of cooking to absorb some of the liquid. Will probably reduce the amount of water I add next time. YUMMY!!! This was really delicious. Very flavorful. Although it was SUPER watery? Like way more watery than the picture. Wonder what I did wrong? Seems like I should have omitted the cup of water entirely. Made this last night, no substitutions. It was a huge hit with the family. Definitely a keeper. Thanks for another great recipe, Gina. Made this tonight. Really great recipe! A definite keeper. This one needs updating, will work on it this week. I didnt see where it had the Pts + value. Is it 7 for both programs, old and +? I just tried the "miracle noodles" and they would be GREAT with this recipe without adding any points at all. This was really easy to make and very good. My hard to please husband loved it! Thanks. I haven't tried, but it should be ok.
Would the Crockpot work for this dish? 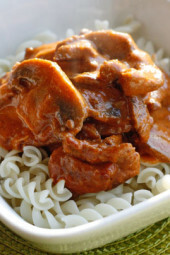 i make my stroganoff in the crock pot all the time – just cut the meat in bigger pieces if you are going to cook it all day. also add the mushrooms at the end. I'm not quite sure, you'll have to check on ww e tools. If I use Sirloin Steak and add 1/2 cup of Red Wine how does this change the point value? Noreen, I always enjoyed this myself growing up. Is the 7pt+ with or without the rice/pasta…I assume it is without, but I wanted to make sure! I haven't tried it, but I'm sure it would be ok.
can you subsitute can of tomato sauce for the tomato soup or cream of mushroom? i don't have this in my kitchen and i want to make it tomorrow. This was delicious! I subbed in carrots because my husband and I hate mushrooms, and it worked really well. Glad you liked it, this actually got my daughter to eat mushrooms, which she normally doesn't like. I don't think she even noticed them! Made this tonight it was FANTASTIC! I usually use a different recipe but this one is better. My husband agreed and told me to to use this one from now on….not so much left over. Thanks! I tried this recipe last night and it is delicious. Not sure what i did wrong though because the steak didn't come out very tender like i expected. i might try a different cut of meat next time. Overall I will definitely make this again!!! Dreamfield's pasta is good to and only 3 pts per serving. Only has 5 carbs per serving as well. For my fellow Texan, you can find it at Krogers. Black Box. Looks great!! I love the Fiber Gourmet pasta too..I find it at our local health food store..or you can order it online. Love your recipes Gina! I must be missing something. In the directions I see where you remove the meat after cooking but I don't see anything about when you add it back in. Assuming when you put the tomato soup, water etc in would be correct.Is that right? Not sure why there's an extra dot there but nothing is missing. I linked to the Fiber Gourmet website, you can buy it online. Not sure where else you can find it? Gina, Could you sub. ground turkey for the sirlion? How would that change the points? I have an award for you over on my blog, A Dash Of Flavour (www.adashofflavour.blogspot.com). I hope you will come and pick it up. 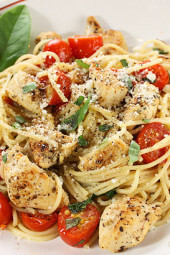 That looks yummy and I am so glad you liked the Fiber Gourmet Pasta! I absolutely love it!! Looks great! I will have to try this really soon. Where did you find the pasta? If you say Trader Joe's I'm going to cry! There isn't one in TX. Also there is an empty dot in the recipe is something missing? By reading the recipe I don't think there is but I thought I would ask.